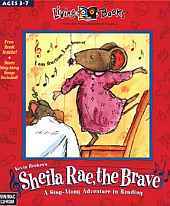 Shelia Rae the Brave is an Interactive storybook based on the book by Kevin Henkes. Venture with Shelia Rae in her town and she'll show you how brave she is and how she loves her family. Sheila Rae is Louise's older sister and she's not afraid of anything - not strange stray dogs or icky spiders or monsters in the closet or anything! Louise is afraid of the risks Sheila Rae takes and wishes she'd be more careful. No more tricks on the bike or stepping on every crack or comparing the cherries in fruit salad to dead bear eyes. How can Louise ever measure up to Sheila Rae? One day, Sheila Rae decides to take a new way home but gets a little lost on the way. Will she ever be able to find her way home? And will Louise ever find her way out of Sheila Rae's shadow? After the first part of the story is read, players can click all over the screen to find lots of hidden surprises. The game also includes a special Treasure Hunt game and a Sing Along section where players can listen to the characters songs that they sing in the story. There is even a demo section to take a short look at some other games by Living Books.